Outstanding Extracts with Soloists, Choir & Orchestra from the Oratorios Jephtha, Samson, Judas Maccabaeus, Saul, Belshazzar, Solomon, Messiah & Joshua. Performances in English according to the traditions of the time with the Maulbronn Chamber Choir and soloists such as Miriam Allan, Nancy Argenta, Catherine King, Sinéad Pratschke, Melinda Paulsen, Michael Chance, Mark Le Brocq, Charles Humphries, Christopher Purves, James Rutherford, Stephen Varcoe a.o. hese live recordings are part of a cycle of oratorios and masses, performed in the basilica of Maulbronn Abbey under the direction of Jürgen Budday. The series combines authentically performed oratorios and masses with the optimal acoustics and atmosphere of this unique monastic church. This ideal location demands the transparency of playing and the interpretive unveiling of the rhetoric intimations of the composition, which is especially aided by the historically informed performance. The music is exclusively performed on reconstructed historical instruments, which are tuned to the pitch customary in the composer's lifetimes (these performances are tuned in a' = 415 Hz). or more than ten years now, we have been documenting the concerts in the Maulbronn Monastery. Among the many wonderful recordings that we have in the meantime released in this series, the performances of the oratorios composed by the man born as Georg Friedrich Händel are a real treasure. To have produced the greatest works of a composer in performance, in the same space, with the unmistakable hallmark of the conductor and with more or less the same choir, soloists and orchestra is something that I find impossible to write about in retrospective at the moment, given the challenges that were involved and the simple fact that the end of this series is not yet in sight. May our future recordings be many and just as successfull. What is the fascination of the oratorios? Old music - it often attracts the wrong sort of clichés. Terms like tension, power, drama and virtuosity are simply not used as synonyms for works of this genre. But it is precisely factors like these that have induced us to preserve the oratorios for posterity, and in all their authenticity - as concerts. Back then, people still had time - there were no distractions like television, radio or the Internet to overwhelm them. And yet Haydn still had great difficulty appreciating the true greatness and power of an oratorio properly. This power, this drama is the idea, the underlying concept of our retrospective. To create a cross-section - an interim balance, if you will - that brings you closer to the world of Händel's oratorios and the world of old music. We couldn't get the thunder choruses of Jericho out of our minds. So, working with Jürgen Budday, we have put together the most moving of the choruses, arias and orchestral sections of the oratorios. 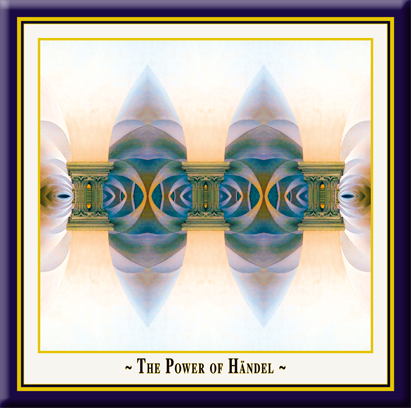 The essence is a cross-section of the most beautiful and powerful moments from eight oratorios about the heroes and kings of the Old Testament: The Power of Händel. andel never set foot in Maulbronn - and basically speaking, his work has nothing to do with the world of medieval monasteries. And yet, for a good ten years now, this town in the old German state of Wuerttemberg that boasts the only completely preserved medieval monastery complex north of the Alps has played an important role in fostering Handel's oratorios. Now, thanks to live CD recordings, Handel aficionados from all over the world can be part of the Handel concerts at the Maulbronn Monastery, a UNESCO world cultural heritage site since 1994. Recordings of nine oratories are in the meantime available. The concerts are conducted by Maulbronn church music director Jürgen Budday, instructor of music at the Evangelical Theology Seminar in Maulbronn and also responsible for church music at the Monastery church since 1978. Since that time, in addition to his official duties, Budday has also acted as artistic director of the Maulbronn Monastery Concerts, which came into being in 1968 and are the setting for the Handel concerts. These mostly take place in autumn, when the Monastery concert season is drawing to a close. The keystone of these concerts is the Maulbronn Chamber Choir, whose origins date back to 1983 and which now draws professional singers from all over Germany. Graduates of the Maulbronn Seminar make up the nucleus of this choir, which was originally formed for a concert tour of the United States. In the meantime, however, the choir and Jürgen Budday have given guest performances all over Europe and performed in the USA, Israel, South Africa and Namibia, as well as twice in Argentina. The CDs of the Maulbronn Handel performances are recorded live and published by the K&K Verlagsanstalt, whose studios are based at Landau in the Palatinate. The company's Maulbronn Monastery Edition also includes highlights on CD of other Maulbronn Monastery concerts. Editor Josef-Stefan Kindler immediately fell under the spell of the Maulbronn ambiance and was so convinced of its artistic potential that he developed the concept of the Maulbronn Monastery Edition. It was clear from the very start that the live recordings of the concerts in this collection would have to satisfy high artistic standards, since they were intended to be much, much more than mere souvenirs or records of events. The same applied to the performances of the Handel compositions. For Jürgen Budday, the important thing was historical authenticity in the actual performing of these works. He too wanted to put Maulbronn's fostering of Handel's legacy into a conceptual context and set up a cycle that was consistent in terms of content. So, contextually, all the Maulbronn productions are arranged in series such as "Biblical Heroes in Handel's Oratorios" or "Biblical Kings" or "Biblical Battle Commanders". The series of live recordings for the Monastery Edition started with "Jephtha" in 1998. "Samson" followed in 1999. After a break of one year, it was the turn of "Judas Maccabaeus" in 2001, then came "Saul" in 2002, "Solomon" in 2003 and "Belshazzar" in 2004. The next two years were dedicated to the "Messiah" - the original composition was recorded in 2005, followed by the Mozart version in 2006, in keeping with "Mozart Year". 2007 saw the live recording of "Joshua". All the Maulbronn recordings are the responsibility of sound engineer Andreas Grimminger of the K&K Verlagsanstalt, and technically the sound is simply exquisite. He places great value on bringing as much of the very special aura of these concerts as possible to the recordings and is highly successful in doing so. There is indeed a particular density to the mood of Handel concerts in this venerable monastery church - and although almost all of Handel's oratorios were composed with secular performance venues in mind, they have found a very suitable home in the Maulbronn Monastery church. It is therefore no coincidence that this is one of the things about the concerts at Maulbronn that even celebrity soloists hold in high regard. Countertenor Michael Chance, who has appeared in several concerts, made a point of telling Jürgen Budday that performing at Maulbronn was "a real highlight" on his calendar - and this is a calendar that includes concerts and operas at top venues. Right at the beginning of the series, Emma Kirkby, a world star on the old music scene, appeared at Maulbronn. And besides Michael Chance, internationally sought-after soloists have come to Maulbronn and continue to do so. They include Nancy Argenta, Stephen Varcoe, Markus Schäfer and Marlies Petersen (shortly after her appearance at the Salzburg festival). But young singers with great promise also figure in the solo parts of Handel's oratorios here. The Emma Kirkby student, Miriam Allan, gave a truly world-class performance singing in "Joshua" - one that was not limited to her rendering of the famous air "Oh! had I Jubal's lyre?". And we will undoubtedly be hearing more of David Allsopp, the young countertenor who also appeared in "Joshua". The orchestra part has been in the hands of the Hanoverian Court Orchestra for some years now. This is an original sound ensemble of top-class musicians, who also love to come to Maulbronn. And, according to Jürgen Budday, the working relationship here is very productive. The Handel CDs of the famous works offer an exciting alternative to recordings by the competition, and the Maulbronn versions are certainly able to hold their own here. Moreover, their value for the repertoire itself is anything but small. Take the case of "Joshua", for instance: to date, this is the only recording of the oratorio superior enough to compete with that recorded by Robert King and his "King's Concert". And the Maulbronn concert recording of the Mozart version of the "Messiah" on original instruments has also enriched the discography significantly. As yet - with the exception of the aforementioned Robert King and Peter Neumann with his Cologne Chamber Choir - no conductor and no choir have so consistently recorded so many Handel oratorios as Jürgen Budday and his Maulbronn Chamber Choir. 22. Help, help the king! Behold! 25. Oh misery! Oh terror, hopeless grief! A superb collection of excellent recordings.